The Great 2012 SFR Pitch Tournament! A fun competition for writers of SFR. To help SFR Brigade writers judge what pitches work best to hook readers. 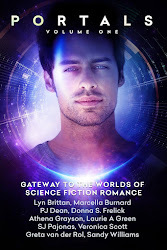 As a bonus, readers will discover some great SFR titles. Up to 50 pitches will be accepted and entered in random order into tournament heats. Winners of each heat will be chosen by poll and then entered in a heat/heats against other winners. Heats will continue until the top three are chosen. The number of heats and duration of the tournament will be determined by the number of entries received. Anyone can vote by poll. Voters are also encouraged to make comments on the Pitch Tournament posts. When will the contest start? We're shooting for January 7th-15th, 2012, depending on the number of entries posted prior to that time. Meanwhile, pitches can be submitted HERE where they will be available to read in advance (with sales links, if provided). Members of the SFR Brigade. Not a member? Join us. There are no dues or obligations to join our alliance. Does my work have to be published? Post your entry as a comment on the SFR Brigade web site forum under the THE GREAT 2012 SFR PITCH TOURNAMENT ENTRIES thread and it will be transferred to a blog post when the Tournament begins. You may enter multiple times, but each entry must be submitted as a separate comment on the thread. 4. Your SFR Pitch: Can be a blurb, query, back cover copy, etc. up to 500 words. What do the winners get? For that matter, what do the non-winners get? Winners get a virtual ribbon, but all entrants get a chance to pitch your SFR (or future SFR title) to readers and visitors (with a sales link, if provided). What can I do to help make this a success? 2. Spread the word through FB, Twitter, email, Goodreads, Shelfari and other forums. Include a link to the Pitch Tournament information. 3. Invite everyone you know to vote. Great! Submit your Pitch Tournament Entry on the SFR Brigade web site forum HERE. This sounds like something that's both fun and a super-useful exercise. The pitch is almost always the last thing we write, even though it's the first thing people read. Thanks for your comments. Hopefully we can make this an annual event going forward. Great idea! I worry over my pitches almost as much as whole book and still don't know if it is right! I'm having so much fun reading the entries. You all have some great pitches! The story that I have coming out that is SFR, I don't have a pitch for. The story I have a pitch for is SF... but kinda light on the R.
Liana, if the second is at least "romantic elements," that works. Or you could try writing a pitch for the SFR. The Geek Girls Are Arriving!